Commissioned digital drawing I finished two or three weeks ago. These are the Sole Bay Swimmers – this is Lisa, foreground, and Debbie, background, who asked me to do this picture for her friend. 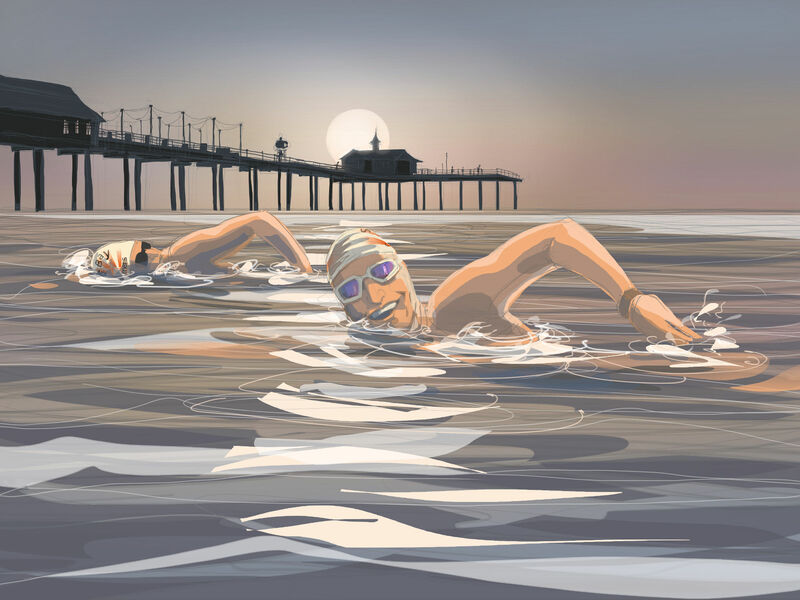 This entry was posted in commissions, digital, swimming and tagged art, commission, digital drawing, open water swimming, portrait, sea swimmers, Sole Bay on July 30, 2018 by Nancy Farmer. Thank you Seb! I was pleased with the lighthouse idea, though I forget it if was mine or Debbie’s now, but it neatly solves the problem of getting the lighthouse, pier and sunrise in the same view when they are in different directions. Thank you for sharing – this is a wonderful piece! I’ve swum with this crowd before and they’re lovely. I especially enjoyed the lighthouse reflection!